The Seneca County Sheriff’s office reports that on Saturday December 1st 2018 at 3:30am, Deputies responded to a one car personal injury accident that occurred near the intersection of State Route 96 and Brewer Road in the Town of Waterloo. Upon arrival Deputies spoke with the diver, Qingshuang Wu age 34 of West Street in Waterloo. 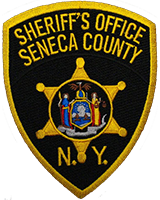 Wu sustained a large laceration to his head and was treated on scene and transported to Geneva General hospital, by North Seneca Ambulance . After being released from the hospital, Sheriff’s Deputies charged Wu with Driving While Intoxicated and also ticketed for Failure to Maintain Lane. Wu was then processed and released on an appearance ticket and is to appear in the Town of Waterloo court on a later date.